We offer delivery services for the trees, shrubs and perennials purchased from our nursery to our customers. 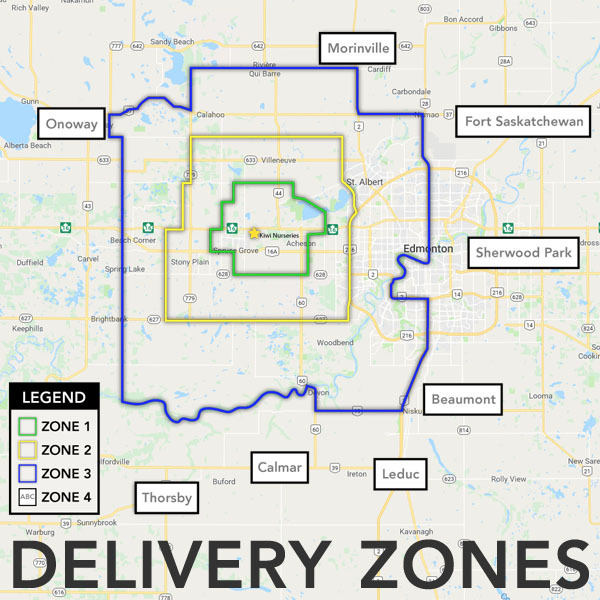 Our delivery rates are based on load size and the distance traveled, organized by delivery zones. All of our deliveries include offloading in the front yard or other accessible location. Please Contact Us for current delivery prices. We also offer planting services for the trees, shrubs and perennials purchased from our nursery to our customers. Our delivery and planting rates are based on pot/wire basket size, load size and the distance traveled, organized by delivery zones. Please Contact Us for current planting prices. Kiwi Nurseries Ltd. will not dig on site if Alberta OneCall locates are not complete and valid at time of installation. Topsoil for backfilling must be provided onsite at time of installation. Plugs will be removed from site by Kiwi Nurseries Ltd. unless otherwise specified. All wire basket planting charges assume the use of a skid steer. Minimum 6ft clearance is required to access your yard with our skid steer. Please Contact Us to obtain a quote or referral.